Last September we arrived in downtown Denver,Colorado at 6 p.m., just in time to walk to famous Larimer Square for dinner. 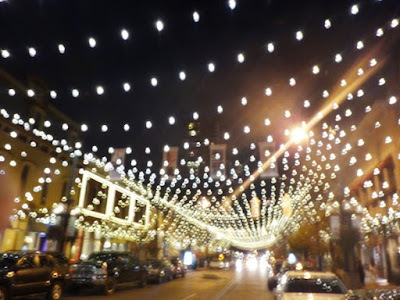 Larimer Square is where Denver started, and today older buildings have been repurposed into modern shops, restaurants, and boutiques that appeal to the urban crowd. It’s easy to love this historic block, which looks especially festive with lights strung across the street each night. 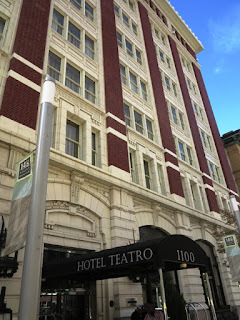 Fortunately Hotel Teatro, where we stayed, was located in the heart of downtown, an easy walk to Larimer Square. Not only was it elegantly appointed, but service was excellent, and we enjoyed skimming historic artifacts in the lobby. 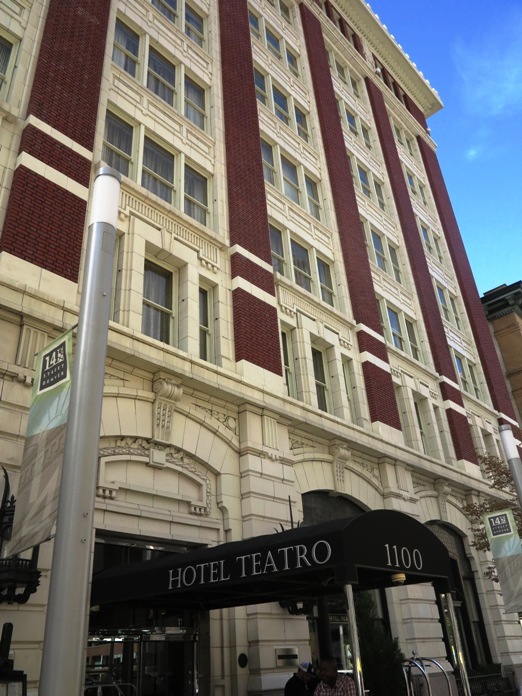 Hotel Teatro was also right across the street from Denver’s Performing Arts Center. Since we only stayed one night, we didn’t have an opportunity to see a performance there, but we marveled at the glass domes and the fact five different theaters are under one roof. 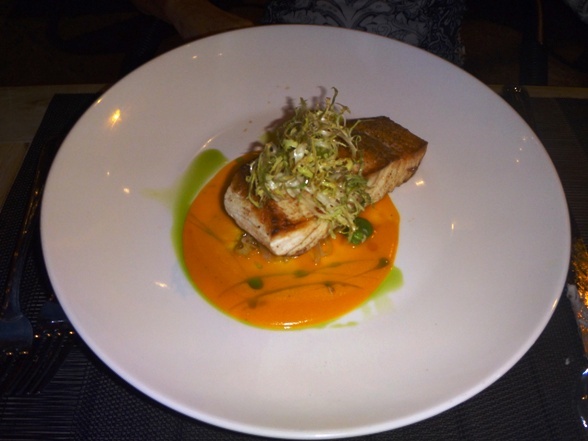 Dinner at Milk and Honey Bar and Restaurant, one of the newest on Denver’s historic block, introduced us to some novel menu items. The choices were upscale and gourmet (no burgers), but the flavors of my halibut and Larry’s steak were fabulous. We noticed other patrons asking for descriptions of some of the dishes, but there was no confusion about the dessert we shared—cheesecake brulee with cherry sauce and mascarpone cream. Yummy! hub with an eclectic array of businesses inside. 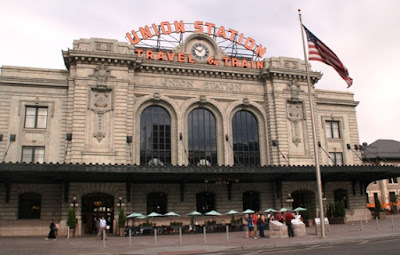 The next morning we visited Union Station, often called “Denver’s Living Room” because so many events and meetings take place there. Owned by the city, it’s still a working train station—but much more. Privately owned businesses lease space from the city, including Snooze, the eatery where we had specialty pancakes for breakfast. We also checked out Mercantile, a farm to table restaurant where guests can watch chefs prepare the food; and Tattered CoverBook Store, Denver’s largest indie bookstore and cafe, a landmark since 1971. 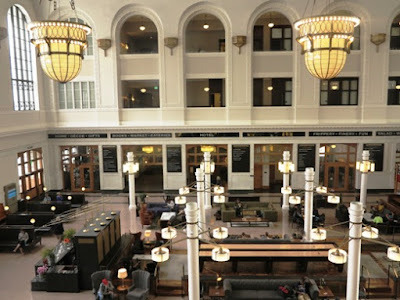 Rooms of the Crawford Hotel, which occupies the top two floors of Union Station, overlook a public lounge and the recently renovated Great Hall. Looking down on the main lobby of Union Station in Denver. The pleasant September weather encouraged us to stroll awhile on the mile-long, pedestrian- friendly marketplace called 16th Street Mall. The only vehicles allowed are shuttle buses that transport people to designated stops along the street. One of my favorite shops in the area was RockmountRanchwear on Wazee Street, started by Jack. A. Weil in 1946 and now run by the third generation. We admired the fine fabrics, detailed embroidery, and lovely designs of western wear and more. Yes, Larry and I each bought a shirt there. Don't miss Denver's iconic, 40-foot tall Big Blue Bear. 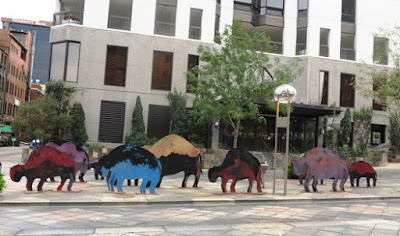 Be sure to mosey by the Colorado Convention Center if you like quirky photo opps. Big Blue Bear, an oversized sculpture that has become a fun icon of the city, quickly catches your attention. 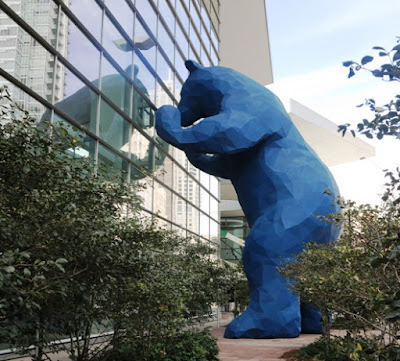 Supposedly the bear, which is peeking into the Convention Center, symbolizes the natural beauty of Denver’s location and the curiosity of its residents and visitors. Street sculptures harken to Denver's western roots. Although we spent less than 24 hours in the mile-high city before driving to other Colorado destinations, we came to appreciate its charming downtown area and decided that we should come back and get to know it better.